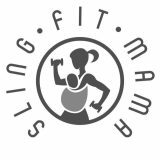 Sling Fit Mama is a post natal fitness class for mums combining toning, strengthening and movement, all done while wearing their baby in a sling. It’s aimed at mums who want the benefit of a lovely bonding class with their baby…but also want something for themselves. It’s run by Laura Banks, a mum of 3 and fully qualified pre and post natal exercise instructor, dance teacher and a babywearing peer support worker. When Laura invited me along to see what she does at the class I was keen to find out more. The first challenge was that I don’t have a baby! 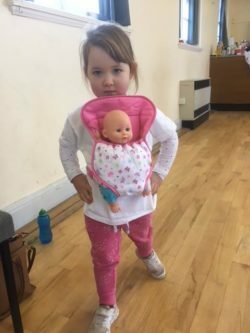 But Laura said I could do the class without as it will still be effective and I do have a 3 year old who has a baby dolly who she likes to take out in her sling, so we both went along and joined in. The class is at 9.30am at Welton Memorial Hall, a nice space with lots of parking too. There were some lovely mums there with their babies who were all very welcoming and chatty before the class got started. Laura then checked everyone’s slings and babies positions and off we went! The first section was aerobic movement which I really enjoyed, nothing too complicated and easy to do with the sling on. We then used a resistance band to do some strengthening exercises and finally some stretching. Laura explained that the class will help to strengthen all the muscles weakened by pregnancy and childbirth and the classes are carefully structured to have your baby in a sling throughout the duration. All the ladies wore their babies throughout the hour (although the novelty wore off for my daughter who abandoned her baby doll and just danced around then had some snacks!). Not only did the other mums have an extra weight for the workout but they could steal a quick kiss whenever they liked! All the babies in the slings were very good and seemed to enjoy it too, the movement lulled a few to sleep and the rest were all very happy nestled in with their mums. The mobile babies came out for the stretching section at the end and played with each other. There is obviously no guilt (or childcare costs) of leaving your baby to do some exercise, you can actually do something for ‘You’ that benefits you both. I really wish this class had been around when I had my baby as I would definitely done Sling Fit Mama. 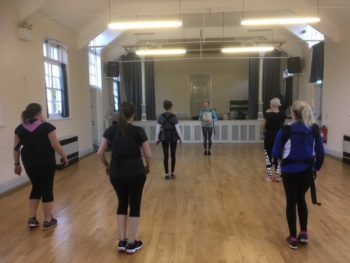 Classes run on Wednesdays 9.30am at Welton Memorial Hall. Classes are also starting in Beverley in February, Tuesdays 1pm at The Arts Garage 2 Studio, Tokenspire Business Park. For more information or to book visit their website here, check out their facebook page here or email Laura on info@slingfitmama.co.uk. Laura also runs a fantastic dance school in at South Hunsely in Welton, LBDA (Laura Banks Dance Academy). A few of my pre-schoolers friends go and rave about it! You can find out more about LBDA on Mumbler here. Please note Sling Fit classes are not running currently, please contact Laura to find out when they restart.